The 2018 award was given to Imtiaz Sooliman the founder, director and chairman of Gift of the Givers, a disaster relief agency, which has been in existence for 26 years. Sooliman commented, "It is a great feeling tonight to have this honour amongst a group of highly qualified business people in KwaZulu-Natal. I never expected to get this award, I am an NGO which deals with humanitarian activities. I feel very humble and special. I feel fabulous that this will open up opportunities to deal with many more businesses in KwaZulu-Natal so that we can help many more people in this country, in the continent and in the world." Sooliman says that he is driven by his motto and that of the Gift of the Givers which is simple. The motto states: "Best Among People are those who Benefit Mankind". Gift of the Givers has delivered lifesaving aid in the form of search and rescue teams, medical personnel, medical equipment, medical supplies, medicines, vaccines, antimalarial medication, high energy and protein supplements, food and water to millions of people in 42 countries, South Africa included. The organisation, due its staff and infrastructure, has extended its activities beyond providing disaster relief to 21 categories of projects. 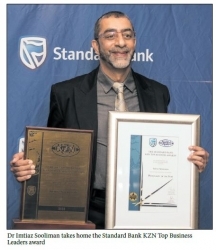 Dr Sooliman commented that the work of the organisation is done through him and not by him and out of a sense of gratitude that he Dr Imtiaz Sooliman takes home the Standard Bank KZN Top Business is not in a situation of need.